I've created a Facebook page to complement this blog. I'm hoping it will be a bit more conversational and plan to post a bit more in the way of general thoughts and ideas, as well as works in progress for feedback. The blog is still kicking, but I'd like to post more frequently. With the Starship Geomorphs book complete I'm looking to provide more varied, but smaller, content in 2019. Total page views: 192,214 since my initial blog post just over three years ago. My average page views per month these days is just over 5,000. Most viewed posts: Starship Geomorphs book, Destiny Class 200 ton Yacht, and the 15mm deck plan collection. Audience: Visitors come from all over the world, but primarily from the United States and the U.K., as would be expected. Primary traffic sources continue to be Google and Facebook. Getting the Starship Geomorphs PDF book wrapped up and released. I was amazed how quickly it took off and spread around the various social media sites and game forums. Thanks to everyone for your kind words and enthusiasm. Marc Miller promoting the book and working with me to create a printed version, instead of slapping me with a copyright lawsuit. Thanks Marc! Receiving an award from the good folks at The Zhodani Base for Best Free or Pay What You Want Traveller Product. I appreciate the recognition and now can technically call myself an award winning author. Mwah ha ha. Blog pageviews shot up to over 18,000 for October 2018, more than triple my normal monthly average. Starship Geomorphs surpassed my previously most viewed page (the Destiny Class Yacht) in only three days! 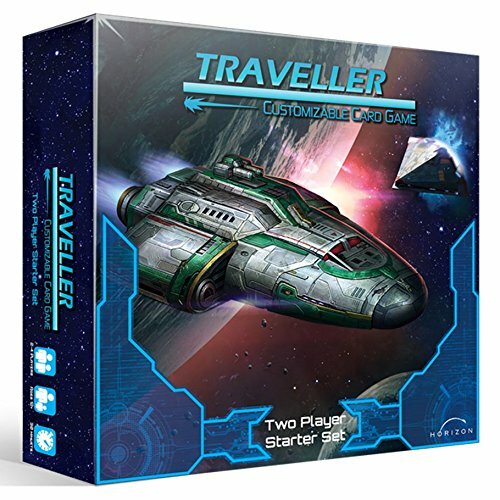 The release of Horizon Games' Traveller Customizable Card Game, and the inclusion of some of my artwork. I just wish I had time to play it. The inclusion of my artwork in the aforementioned Traveller Customizable Card Game. I'm not trying to be overly humble here, but the quality of my artwork just does not stand up with the rest included in the game. It's a little embarrassing. There is a lot of great artwork there. I want to put a bug in Jeff Yin's ear about doing a Kickstarter to produce a coffee table book of some of the artwork. Not enough time for this blog. While I'm enjoying the strong economy and the building developer client I am working with, it would be nice to have a few days off. The two weeks I was hoping for around the holidays turned into just two days. I'm really envying those Travellers out there who've mustered out and are living off their fat pensions. That's how it works, right? Not making the time to play my solo Traveller campaign. Do you ever imagine what your PCs are up to when you are not playing? Mine have been sitting in a cave for over a year now. What's in store for 2019 (and beyond)? A print version of the Starship Geomorph book - I was finally able to get some revised test print files to Marc Miller, who is looking to set up Print On Demand printing through Drive Thru RPG. More information should be coming soon. 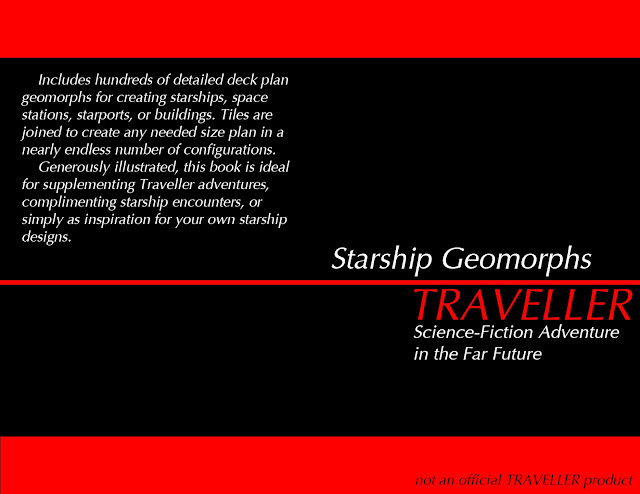 The Starship Symbols & Spaces book - kind of a sister project to the Starship Geomorphs book. It will include a wide variety of starship rooms and component parts as both a PDF file and DWG/DXF formats. Nearly complete. Traveller themed starship symbols for Cosmographer - I spoke with ProFantasy Software - the makers of Campaign Cartographer and Cosmographer - and they created some starship content inspired by my geomorphs, but with their own unique look. Ideally I'll find time to learn the software and be able to convert my starship symbols and spaces into usable components for Cosmographer. Alternately, this might be something that could be crowd sourced by the Cosmographer community using my starship symbols files. An Easter Egg post - probably in April - showcasing a bunch of the unusual things I've included in my illustrations many readers may not have been aware of. I've got a ton of incomplete projects I want to get finished, and am hoping I can discipline myself to finish those before starting the other ton of projects still in my head. Interior illustrations of the Kugashin/Lavalier Class Laboratory Ship. I've already got it about 75% modeled. I don't think I've seen any interior illustrations of this ship. 600 ton "adventurer" ship - a collaborative effort I started with a blog viewer. I put this on the back burner because I felt the geomorph book was so close to completion and would be of interest to more people. A robotic armed work pod vehicle, inspired by a recent discussion on one of the Traveller Facebook pages. I'd love to do another 30 day blog challenge. It's a great way to create a lot of content in a relatively short period of time, and really gets the creative juices flowing. Unfortunately, the type of content I want to create takes more hours a day than I have available. I've got tons of deck plans, robots, and other designs in my sketchbooks and binders. A 30 day challenge is not too likely to happen in 2019, but I like to keep it on my list. 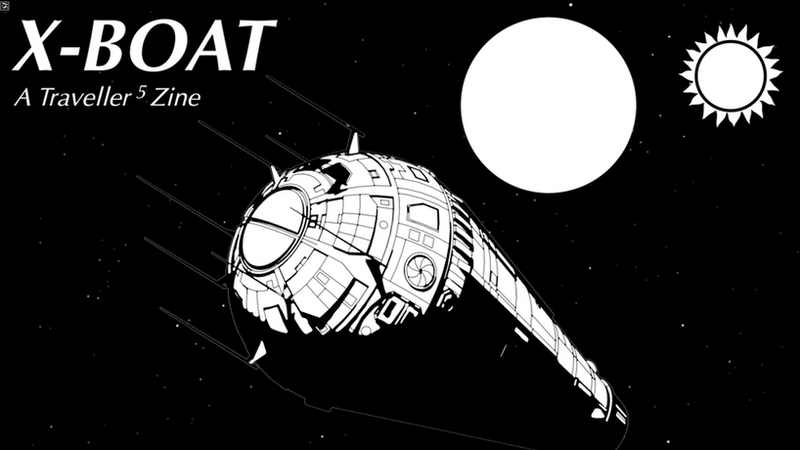 I'm getting antsy to design a downport, or better, something like my own version of Fifty Starbases that Judges Guild put out. I've also been considering doing something like A Naval Architect's Guide to <blank> series, starting with Staterooms, showing various room types, layouts, and fittings. I've got a lot of this type of stuff drawn or modeled already, I just need to clean it up and get it out there. Thanks to everyone for your support and feedback. Happy Travelling! Wow. It's great to see so many responses to the Starship Geomorphs book. Thanks to everyone for their positive feedback and constructive criticisms. 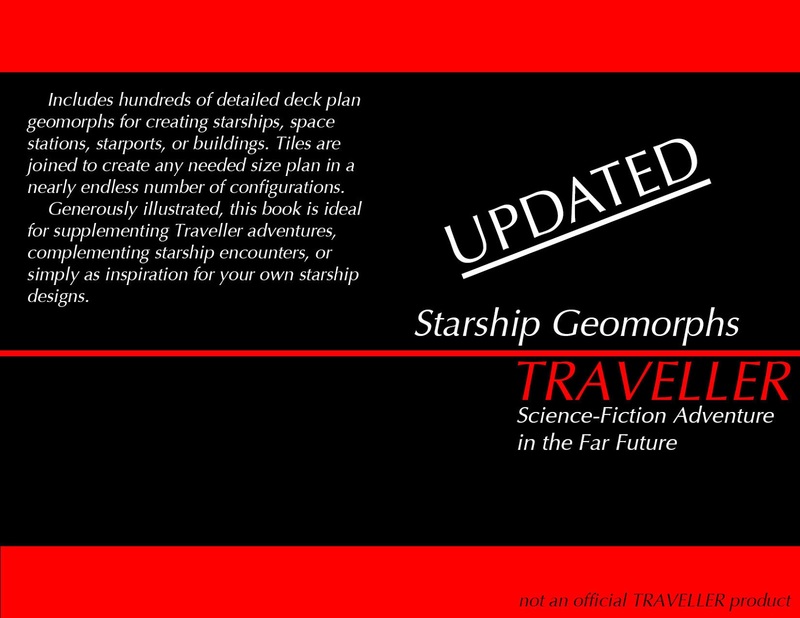 I will be re-releasing the Starship Geomorphs PDF in a week or so with corrected spelling (What? You've never heard of Marshal Arts?) and grammar, a few graphic and miscellaneous tweaks to some geomorphs, and the ability to turn on/off individual drawing layers including a second optional hex grid. This will allow you to do things like select square grid, hex grid, or no grid at all, turn off text for player maps, and turn off shading for less ink usage when printing. Additionally, Marc Miller and I have started talking about making a print version available to those who want it. There are no specifics yet as I want to get the edited PDF version off my plate first. I'll keep you posted as I learn more. Finally, I'm also working on a starship "symbols" PDF book that would be a collection of individual rooms and room blocks for those who want to lay out ship plans that way. The book will probably include supplemental .DWG and .DXF files. I just wanted to post a quick shout out to Geek Gamers, who has a solo gaming channel on YouTube. She recently posted an example of solo play for the Traveller Customizable Card Game. I just received my reprinted cards in the mail last week and am looking forward to giving this a try when my free time opens up a bit. I'd be interested in hearing from other Traveller players who have played this, either solo or with others - please leave comments below. 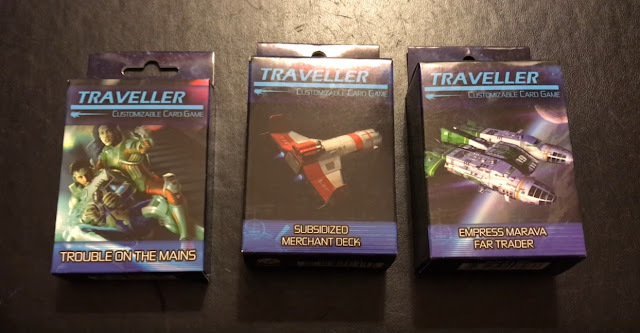 Geek Gamers has added a second video reviewing the Trouble on the Mains, Subsidized Merchant, and Empress Marava expansion decks. The Starship Geomorphs book is finally complete and ready for download. I can safely say after three years of putting this project together the itch has been thoroughly scratched. If you have any constructive criticisms please comment below. I'm not opposed to revisiting this sometime in the future if the situation warrants it. In the meantime I'm going to take a short break and get back to some smaller, less intense projects. Thanks for your patience, I hope you find it worth the wait. The scale provided in the PDF is 1/4"=5'-0" or one square grid. This is simple enough to scale up for 15mm (1/2"=1'-0") figure use. If you are using a standard letter size (8.5"x11") printer you will be limited to Edge and Corner Geomorphs which will print out at 10"x5" and 5"x5" respectfully. A Standard Geomorph will print at 10"x10" so will not fit on letter size paper, but if your printer supports 11x17 that would work. Kidding aside, here's how I did it using Adobe Acrobat Pro. Your software may vary. For Standard Geomorphs at 15mm or any geomorphs at 25mm scale (1"=5'-0") I would use the same process as above, but change the paper size to something like 11x17 or 18x24, depending on what your are printing, set the Custom Scale to 400% (for 25mm) and instead of printing to your printer, I'd print to PDF, and then send that PDF to a print shop for printing if you can't print the larger paper size. You may be able to set it up such that you print a larger drawing on a series of 8.5x11 sheets and tape them together, but personally I would not go that route. Good luck! This PDF version is mainly intended for viewing on a computer or other device. While in my experience the individual geomorph pages look fine when printed, the illustrations come out very dark. It is doubtful that I will be creating a print version. Regarding navigating through the document: I spent a good amount of time creating hyperlinks all through the document, so it should be very easy to find what you are looking for. I find jumping to the Indexes at the back of the book, clicking on what I am looking for, and making copious use of the Alt-Left Arrow to go back to the previous page to be very helpful. The book is also fully bookmarked.